Inclusive Cycling in Gosforth- the OK, the Bad and the Ugly. One in five people have some kind of disability. People with a disability are much more likely to be physically inactive and to rely on driving for day to day travel. Being able to cycle is a good way to improve health and well-being and to combat social isolation. Many disabled people do cycle and find it easier than walking. They often use specially adapted cycles which tend to be wider, longer and heavier than the usual two wheeled bicycles. 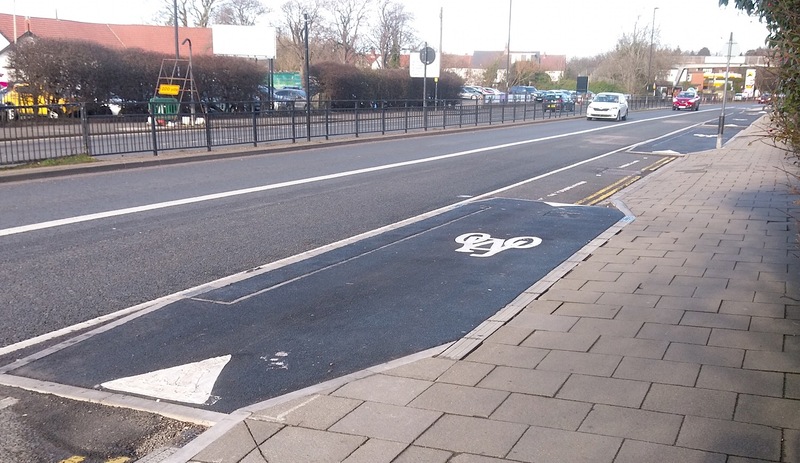 Poor infrastructure is one of the biggest barriers and the cycle network is often designed around two wheeled bikes and the able bodied cyclist. 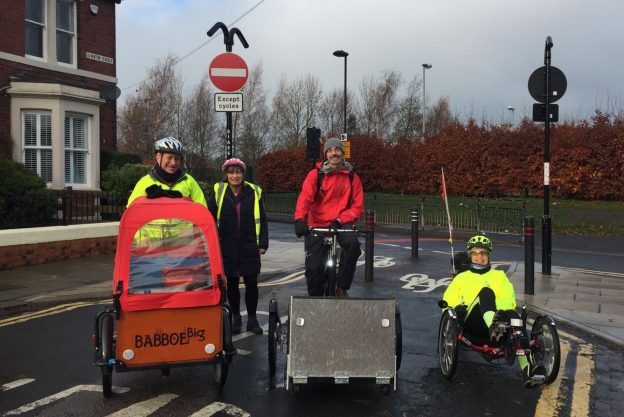 In November 2018 SPACE for Gosforth members and volunteers explored local cycling routes from the perspective of disabled people using adapted cycles. You can see the first report here. What we noticed was that the quality of cycleway required is very high. John Dobson Street, Eslington Terrace and Brandling Park come near to it. Bringing Gosforth’s other cycle paths up to standard will take a lot more than removing bollards and putting in dropped kerbs. We realised we need much more radical changes to get disabled people cycling. And it’s exactly those radical changes that will get other people cycling too. Having said that, here are the examples we found of problems faced by disabled cyclists. Where possible we have suggested improvements. We chose a route we thought representative of the various facilities we have locally. The ups and downs on the new south bound cycle way would be very difficult to negotiate with any type of adapted cycle. The best facilities are wide and flat without gradients and humps that can cause lower and longer cycles to ‘bottom out’ uncomfortably. Slopes can be difficult because disabled riders often cannot ride out of the saddle or may have to power their cycle by hand. This section is also narrow in places with sharp turns. The width of the path between the kerb and the Orcas is quite narrow and prevents any overtaking. 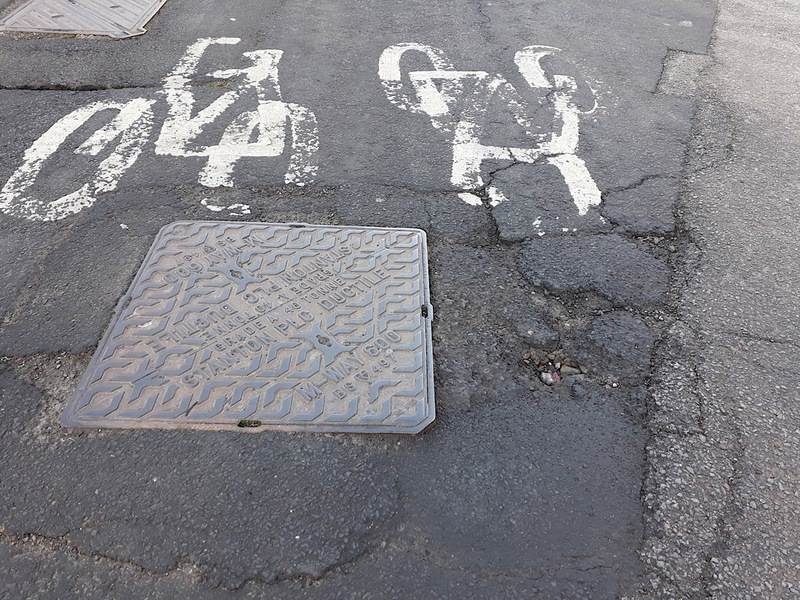 Wider three wheelers often used by disabled people need to be carefully steered and it’s not possible to avoid debris, drains, puddles and pot holes. Anyone wanting to exit or join the route along the way would have to go up or down a kerb which could tip the rider into the traffic. 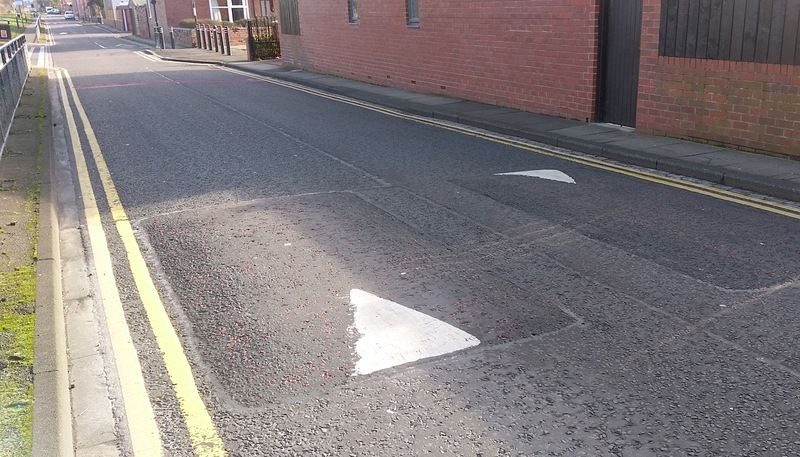 A number of local roads have speed humps which can force people to cycle in the middle of the road or cause a non-standard adapted tricycle to tip uncomfortably. Disabled riders may have painful conditions that can be exacerbated this way. Christon Road is an example and there are several others, including Polwarth Drive, Regent Road North, Regent Farm Road, Hollywood Avenue, the race course and St Nicholas hospital. Alwinton Terrace is an identified cycling route into the City. There is a very poor road surface here with painful bumps, ruts and holes. 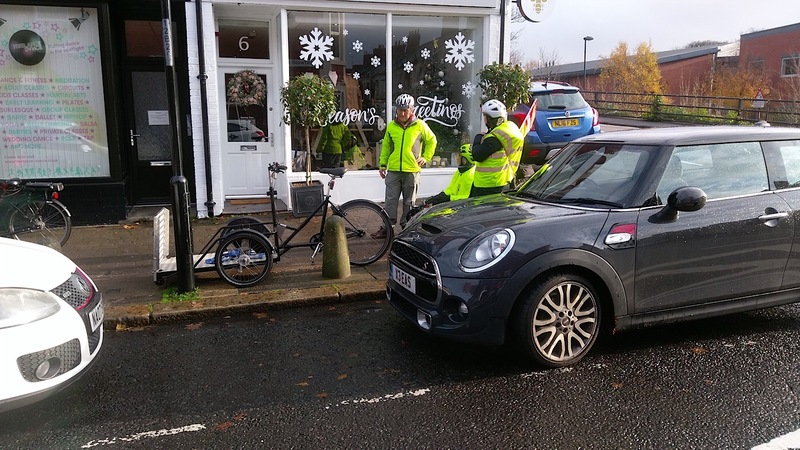 There are parked cars on both sides of the road and a number of crossings with poor visibility making it hazardous especially for low recumbent cycles. North west corner of Little Moor. 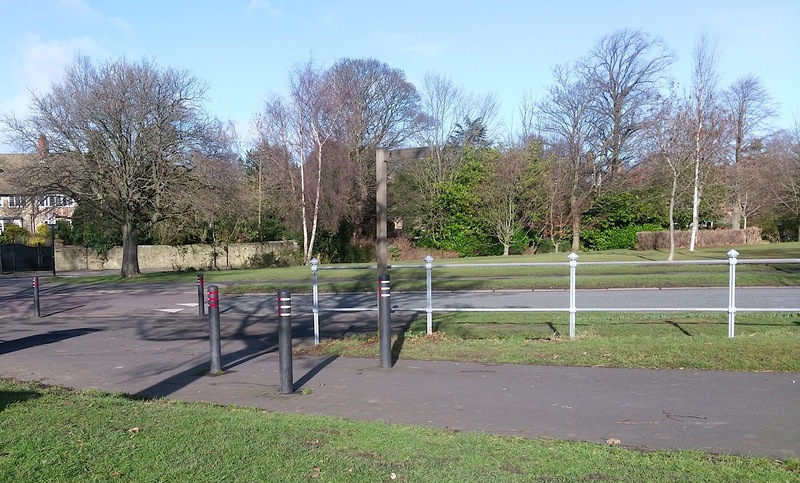 The distance between these bollards is less than recommend 1.5m and this is combined with a short steep slope. Steep gradients are difficult because disabled cyclists often cannot stand up to increase effort on the pedals or may even have cycles powered by hand. It’s often the case that longer and lower, adapted cycle riders cannot reach the crossing buttons without projecting the front of their cycles into the road. 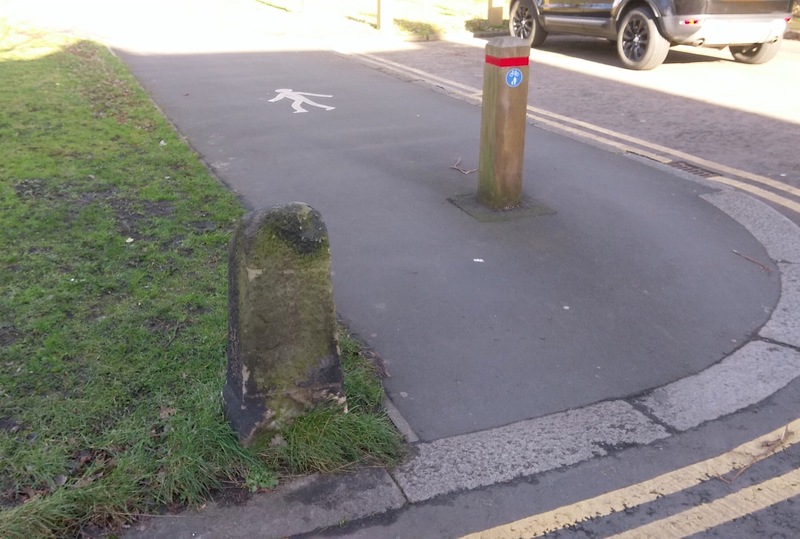 There are wooden posts here centred on the cycle way which prevent wider cycles getting past without going over the kerb or verge. We think these could easily be removed without causing any problems. This is a typical local destination popular for shopping and restaurants. There are parked cars and a kerb along the whole length except for the very southern end. 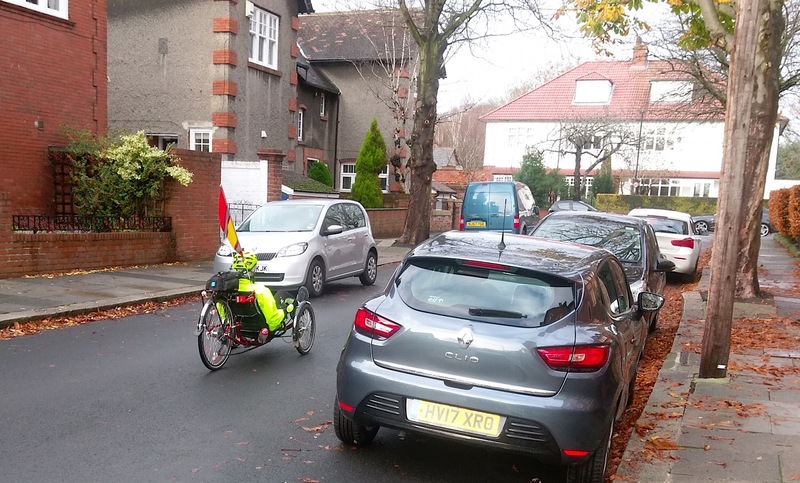 A disabled cyclist would need to either park on the road in a car space or negotiate the narrow drop onto the pavement. Access to the shops is restricted by parked cars. We think a raised road table would be useful here to manage traffic speed and facilitate access to the shops. 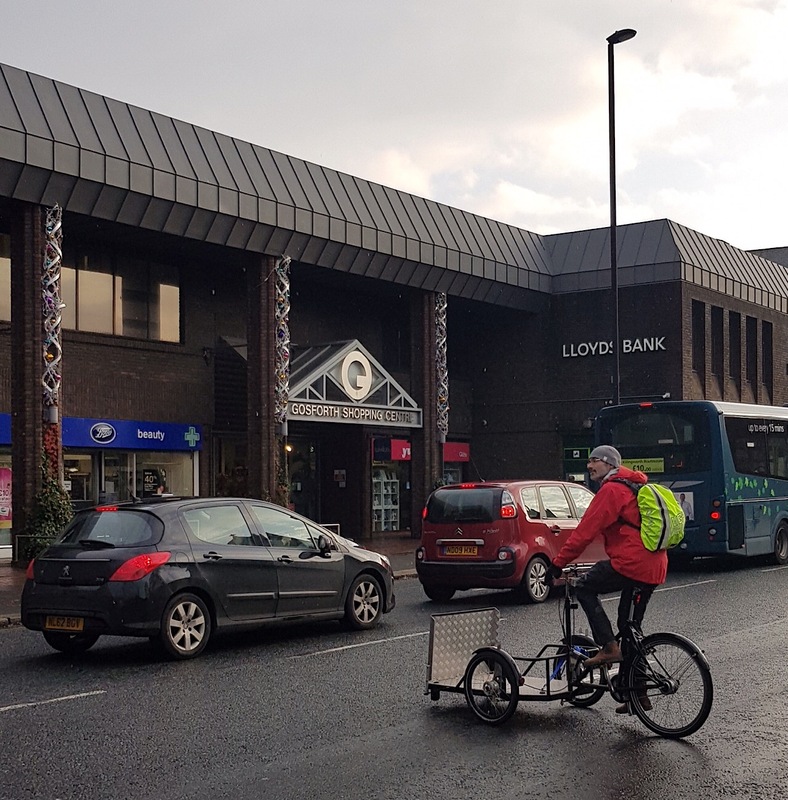 The pavement is also full of street furniture and concrete bollards which could be removed to enable wheelchair and adapted cycle users to enjoy the facilities. 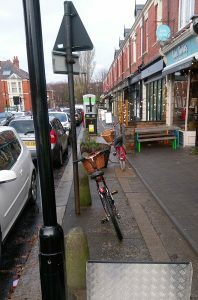 (We understand that this area is going to be de-cluttered as part of the Jesmond Streets for People project.) It would also be good if there were cycle parking facilities with enough space for adapted cycles. The town moor is one of the most used cycle routes from Gosforth to the City centre. We found the entrance, exit and other gates too narrow to easily get through and difficult to open without dismounting which disabled cyclists often cannot do. Wider, push-button powered gates would be great improvement. Gosforth roads between Kenton Road and the High Street. These residential roads are an essential east/west cycling route to and from the main Gosforth destinations. They are relatively quiet and good for cycling but have some potholes and poor surface quality. There needs to be an identified cycle route with signs to encourage drivers to watch out for cyclists and to give them priority. This is a good example of the problem caused by parked cars for lower recumbent cycles. They can be hidden from view and warning signs to encourage slower speeds would improve safety. West Avenue across the High Street to St Nicholas Avenue is a main east west cycling route to the shopping area, church, park, gym etc. It was virtually impossible to cross without dismounting. Perhaps expanding the traffic lights north to include the junction with West Ave would make it safer. 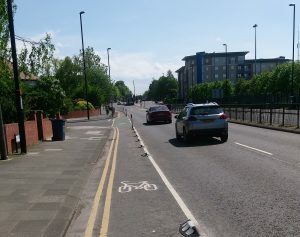 A raised road table on the High Street from West Avenue and along the extent of St Nicholas Avenue up to the entrance to the Park would help disabled cyclists to travel this way and would be beneficial for everyone walking and cycling there. These are just some examples of the difficulties faced by disabled cyclists and we are sure you can spot more. Under the Public Sector Equality Duty, the council does have to plan for everyone and if Newcastle is to become a cycling city then it needs facilities that can be easily used by disabled riders too. We would like to thank the Tim Lamb Centre for the loan of the wheelchair cycle. Which works best – Tolls or a Clean Air Zone? 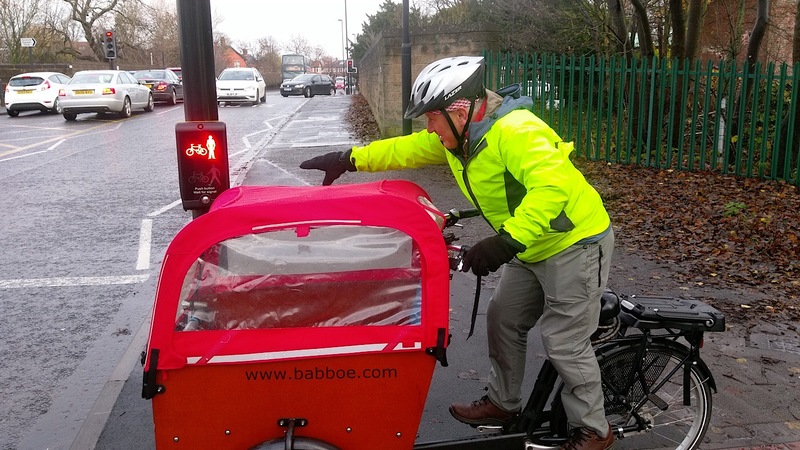 This entry was posted in Accessibility, Cycling and tagged Accessibility, Adapted Cycles, cycle paths, cycling infrastructure, disability, inclusive cycling, public sector equality duty on April 1, 2019 by SPACE for Gosforth.